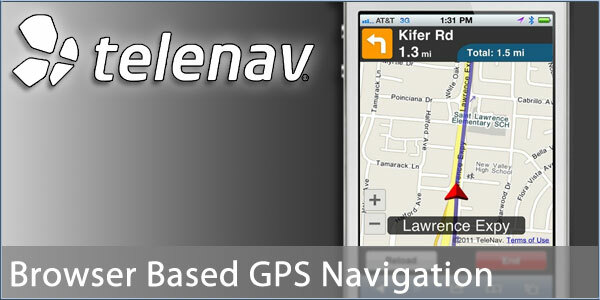 TeleNav have announced the first of its kind, browser based, turn-by-turn GPS navigation solution. Thanks to the advent of HTML5, the new wunderkind web language, it is now possible to offer a viable, app free navigation platform that requires nothing more than a web browser and a GPS receiver to bring full, voice-guided, turn-by-turn navigation to mobile devices. TeleNav are initially launching the service to developers ahead of a public launch early next year. It supports full colour moving maps, audio and automatic re-routing. Sal Dhanani, co-founder and vice president of products for TeleNav said, "with one line of code, you can give your customers one-click access to premium, voice-guided turn-by-turn directions to any location, including hotels, restaurants, merchants or deal locations." Is that "Premium" like the phone calls etc? i.e. not free? Until mobile data becomes cheaper and people get more of it (i.e. unlimitied) then I won't be using services like this. Besides Vodafone have more 3G blackspots then I care to think about so maintaining a reliable connection for navigation will be interesting.